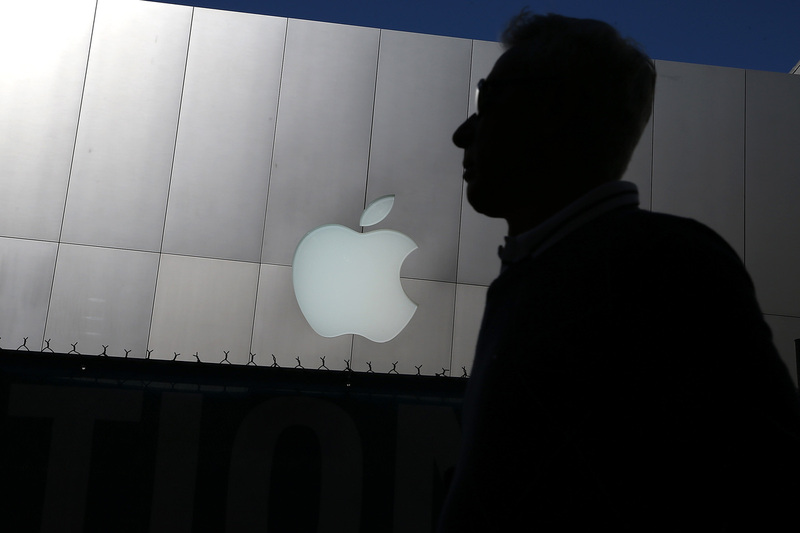 Book News: Judge's Comments Bruising To Apple's Price-Fixing Case : The Two-Way Also: Mary Karr on addiction and David Foster Wallace; Maria Semple calls Jonathan Franzen her "big daddy." A person walks by an Apple Store on April 23, 2013 in San Francisco, California. U.S. District Judge Denise Cote, who will hear the Justice Department's e-book price fixing case against Apple, hinted at her initial leanings during a pretrial hearing: "I believe that the government will be able to show at trial direct evidence that Apple knowingly participated in and facilitated a conspiracy to raise prices of e-books, and that the circumstantial evidence in this case, including the terms of the agreements, will confirm that." Reuters adds: While she stressed that the view was not final and that she had read only some of the evidence so far, her comments could add to pressure on Apple to settle the lawsuit, in which the Justice Department accuses the company and five publishers of conspiring to fix e-book prices." The trial is set to begin June 3. One of the publishers accused of e-book price-fixing, Penguin, has now settled with consumers and the Attorneys General of 33 states for $75 million, after settling with the Justice Department last December. Poet Mary Karr speaks to the addiction and recovery website The Fix about the fallacy of the "tortured artist": "I think being tortured as a virtue is a kind of antiquated sense of what it is to be an artist." She also touches on her friendship with David Foster Wallace: "I think we kept each other alive to some extent, for a period of time when we were trying to quit using and it was all but impossible for each of us to do that." In reaction to the news that Amazon will begin selling fan fiction, Melville House's Dustin Kurtz writes some (mildly racy) fan fiction featuring Gossip Girl's Blair Waldorf and Amazon CEO Jeff Bezos: " 'It's important you listen to me, Blair.' Jeff ran his hands over his gleaming scalp." Maria Semple — screenwriter, amphibian enthusiast and the author of the brilliant novel Where'd You Go, Bernadette — tells The New York Times about her reading habits. She said, "My favorite kind of book is a domestic drama that's grounded in reality yet slightly unhinged. So Jonathan Franzen is my big daddy." She also notes, wisely, that "I steer clear of any novel that gets billed as a 'meditation.' I've seen 'moving meditation,' 'elegiac meditation,' even 'angry meditation.' To me, this is code for: Run! There's no story!" Alberto Manguel writes about dreams for The New York Review of Books: "In literature, dreams often serve to bring the impossible into the fabric of everyday life, like mist through a crack in the wall." The silence surrounding the resignations of senior editors at the literary magazine and publisher Granta has finally been broken. Editor John Freeman, who recently announced his departure, told The Guardian that owner Sigrid Rausing "decided a while back she wanted to run the magazine and books on a very reduced staff," and that he "didn't want to be part of that change."